My creative Therapy: Merry Christmas! Santa arrived today and brought me Photoshop Elements 5! So, guess what I've been playing with today? It took a while, but I figured out how to make a watermark for the pics I post online. I spent a good while yesterday (Christmas Eve) stamping just for FUN! I got lovely as a tree with my order last week and just had to play with it. I cased a card from the splitcoaststampers website. It's been done so many times that I really have no idea who to give credit to. I simply stamped the trees on white cardstock with black stazon, then I stamped it again on a post-it to make a mask to protect the 'snow' from the brayer. It was brayered with the blue frost spectrum pad. Not sure if these next steps have been done to it though, I added falling snow by using one of the stamps from SU! 's 'Snowflake Spot' stamp set using white craft ink. 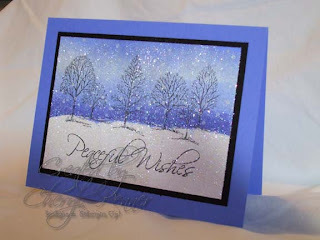 After I stamped peaceful wishes (from the 'Peaceful Wishes' set) in black stazon I let the craft ink dry and then stamped over the surfact with a glue pad and covered the piece with Dazzling Diamonds glitter. It is matted in black and put on a brilliant blue card. So simple, but I LOVE how it turned out. Tommorow I'm gonna work on finishing a card I started with an upcoming Level 3 Hostess set. It's called "Time well Spent" See you tommorow! Your card is beautiful. I love Photoshop Elements I know you will have fun playing with it. Your blog looks great. I really like the little punched shapes for fudge. This card is just so beautiful and sparkly! Great work! My 6 yo made this! I'm joining the blogging world!